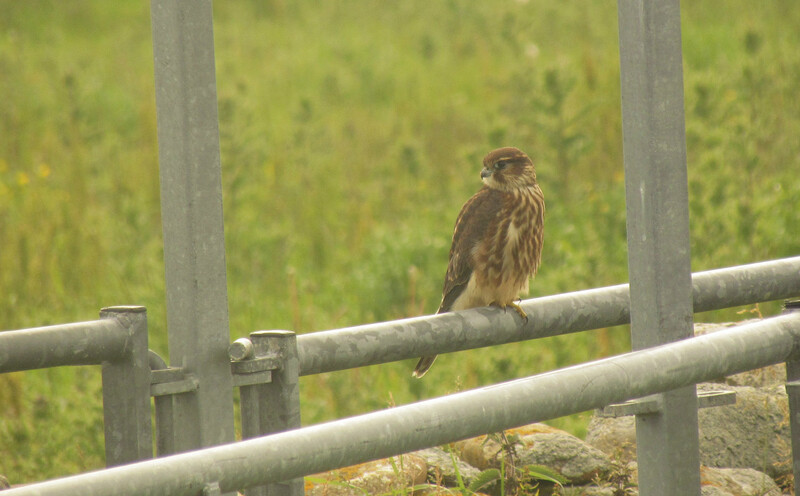 July's end brought a Hobby, Merlin and Peregrine to the island, providing some action after a quiet few days with only a Leach's Petrel on the 27th and the Black Tern at Brides Ness on the 30th of particular interest. 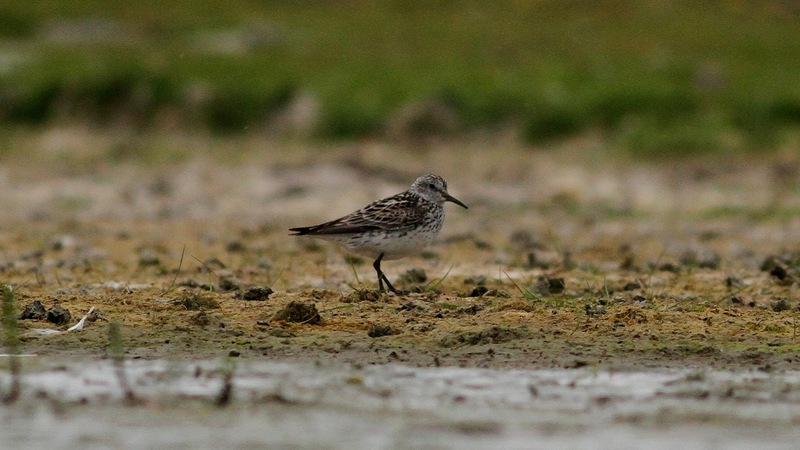 Wader passage produced a Ruff on the 30th, rising to 3 on the 31st, a Green Sandpiper and 2 Greenshank on the 27th, with 1 Greenshank still on the 29th. The island has been quiet for passerines, as perhaps expected for the time of year. 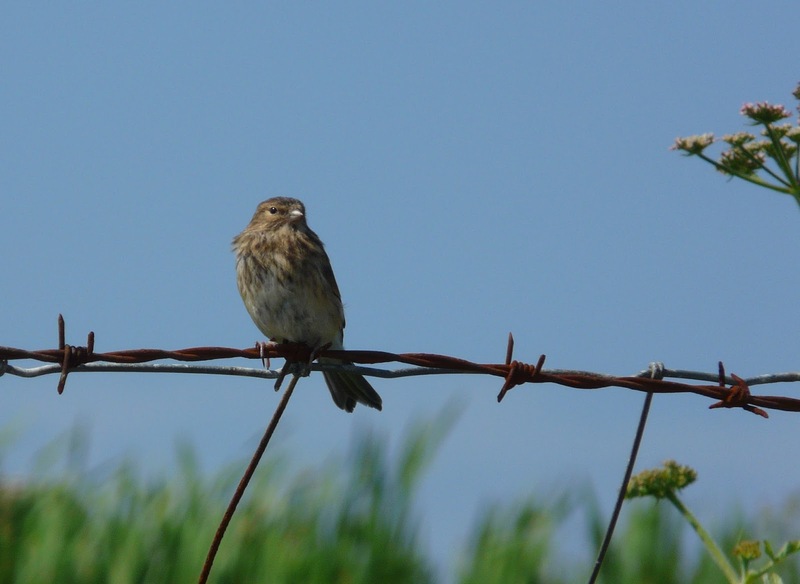 Redpoll numbers peaked at 9 on the 27th, but are being seen everyday in small numbers between Holland and the Mill. There were 5 Sedge Warblers on the 27th and 1 Chiffchaff seen at a variety of locations on the island throughout the period. 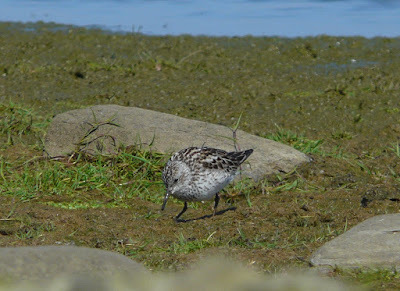 There are no new birds to report from the last four days, although the highlights of summer are still sticking around, with the White-rumped Sandpiper seen at Bewan loch on the 24th, a Red-necked Phalarope at Nouster Beach on the 23rd and the Black Tern seen on the 22nd, 24th and 26th. The Quail was heard again in the fields around the post office from the 24th. 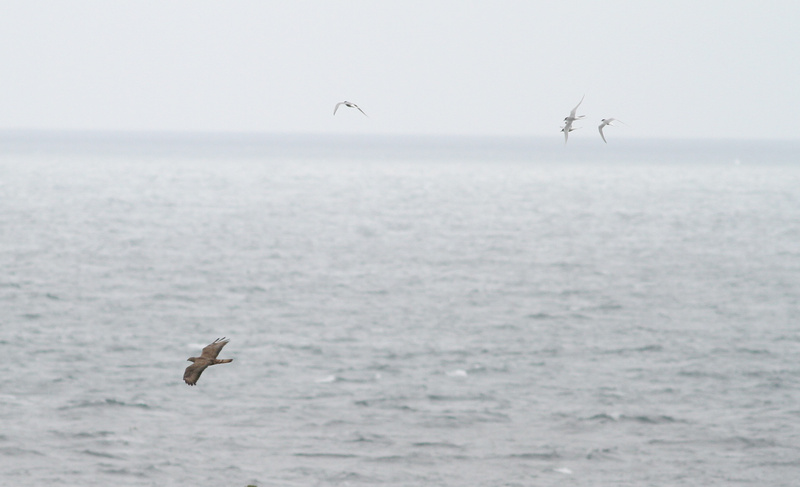 Autumn seawatching season begun on the 25th with a Sooty Shearwater passing, with 7 Manx Shearwaters also seen. A Short-eared Owl showed well to one observer at Gravity and 13 Redpoll were present (with 7 trapped) on the 25th. 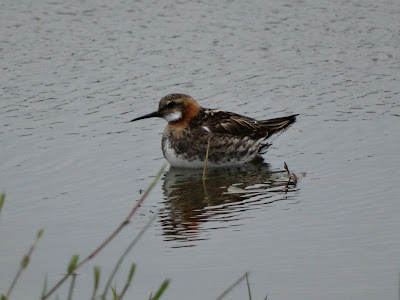 Other migrants included 3 Green Sandpipers and the first Red-breasted Merganser of the autumn on the 22nd. Arctic Tern counts peaked at 4133. The recent flurry of Hummingbird Hawkmoth sightings was proven to consist of at least two different individuals on the 25th, when one was found dead around the obs before one was seen around Nouster. 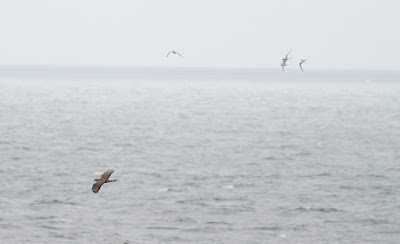 A Honey Buzzard took us by surprise today, startling the observer as it flew north over Gretchen loch at 4pm, pursued by Arctic Terns. 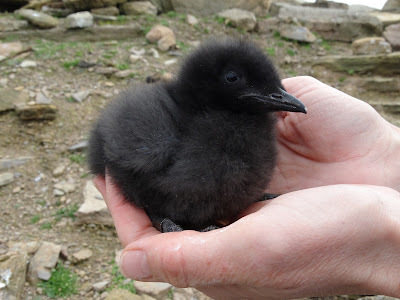 It was tracked up the island to Nether Linnay, before turning south over Torness and being lost to sight. 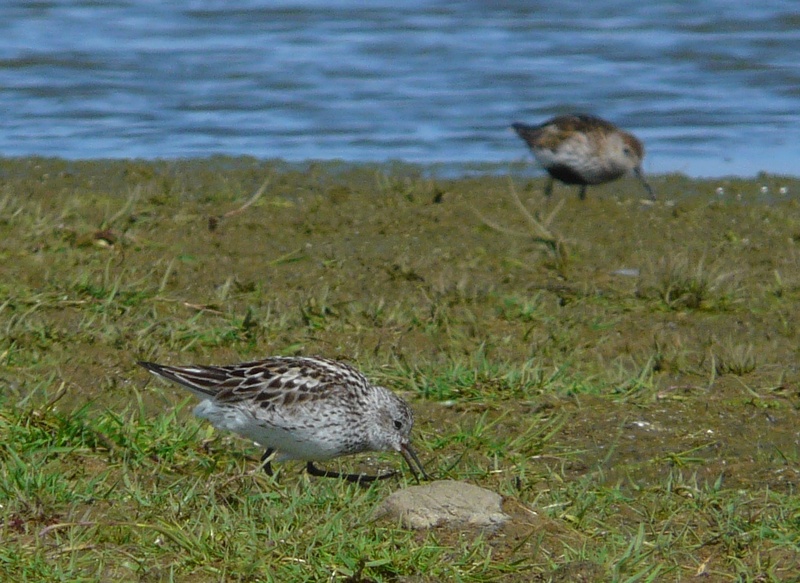 There was no sign of yesterday's White-rumped Sandpiper despite a thorough look by a volunteer team who are quite embarrassed about misidentifying it. The 18th brought the island's fourth ever record of a Bee-eater, found over Westness and watched drifting in land towards the East Links, where it wasn't refound, but presumably was the bird seen on Sanday the next day. This follows just two months after the island's third record was seen over three dates in late May. A White-rumped Sandpiper was a surprise find at Sandsheen on the 20th - the second record for the island this year. 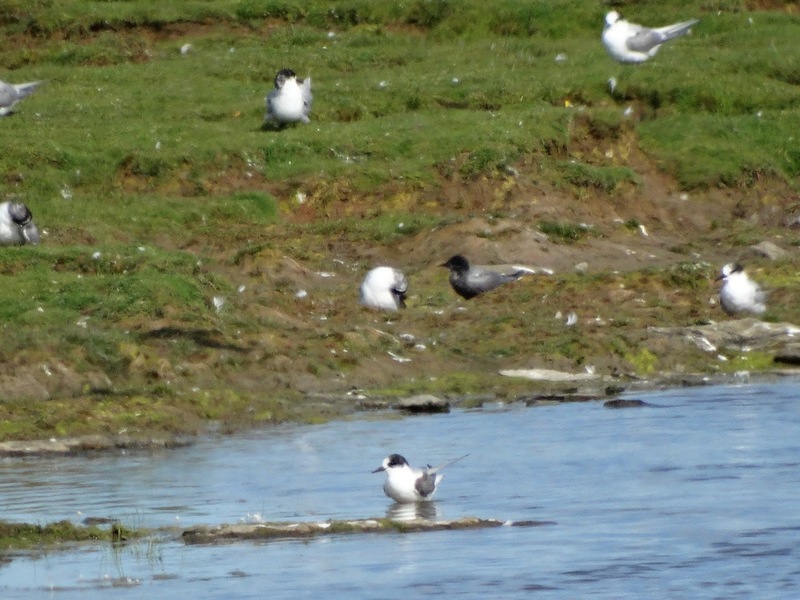 Black Tern remains seen irregularly on the island, with sightings at Nouster and Westness on the 18th, whilst two Swifts were also seen on the 18th. 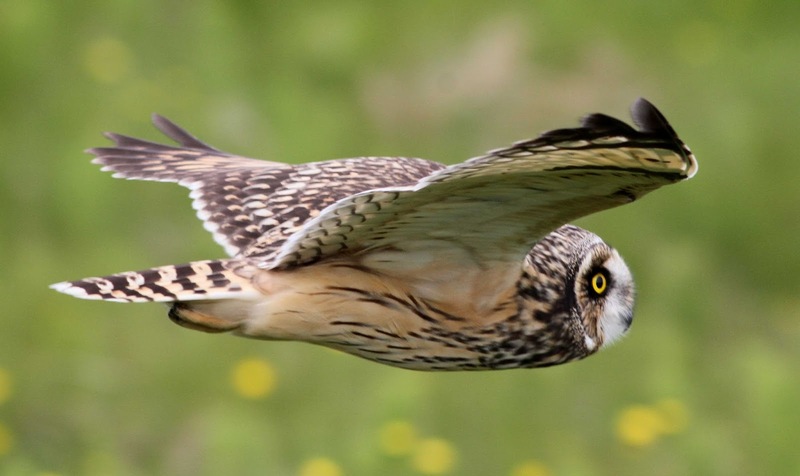 Last week's Quail was heard on the 19th and the Whooper Swan remained on its usual lochs on all dates. 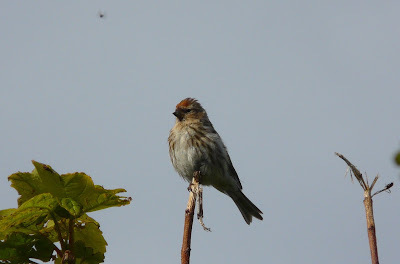 Redpoll numbers peaked at 23 on the 16th, tailing off to 14 on the 18th and 11 on the 19th. A Ruff was present at the Post Office flash on the 20th. 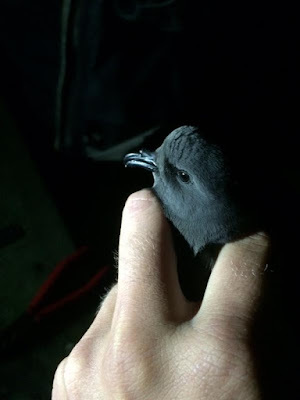 A busy night of trapping on the 19th/20th resulted in 114 Storm Petrels, with 3 controls and 111 new birds, with one having unusual leucism. Amongst the Storm Petrels, 1 Leach's Petrel was trapped and ringed. A Hummingbird Hawkmoth was seen at Holland gardens on the 18th and at Ancum on the 20th. Despite being midsummer bird movement is ticking over quite nicely. 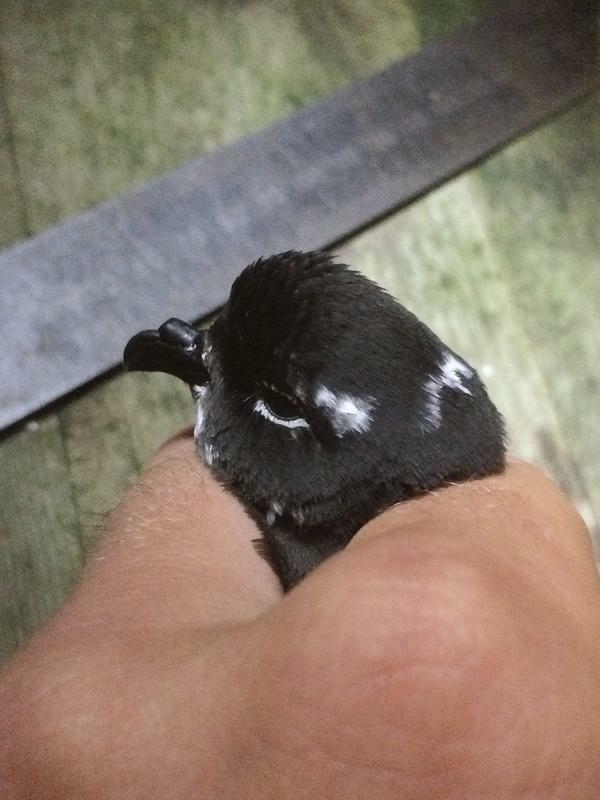 The highlight was a Leach's Petrel, trapped and ringed overnight on the 15th, as were 48 Storm Petrels, the highest total of the year so far. Also newly arrived on the island are Common Redpolls, a count of 3 on the 14th had risen to 14 on the 15th, while the Quail near the Post Office was also heard on those two dates. On the 14th a Ruff was briefly on the Post Office flash, while Golden Plover numbers had peaked at 859 birds. More unseasonal sightings included a Short-eared Owl on the 13th, 2 Sand Martins on the 14th and a Whooper Swan still being seen everyday. The wind swung easterly briefly and brought rain and a Red-necked Phalarope to the island on the 10th. A nice male, it showed well on the post office flash and pond by Scots Ha before moving to the Nouster area on the 11th. 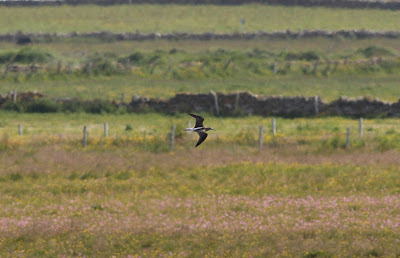 A Green Sandpiper instead took up residence on the post office flash on the 11th, whilst a Swift was seen high over Bridesness on the same day. 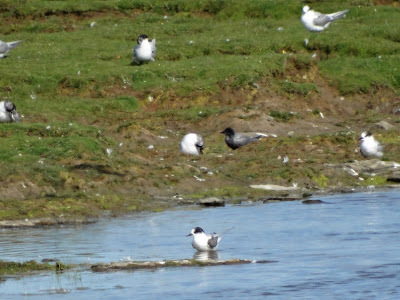 Meanwhile the Black Tern made a reappearance amongst the Arctic Tern flocks at Bewan Loch on the 9th. Golden Plover numbers keep building: 187 on the 10th became 328 on the 11th. noted on the 11th in unexpectedly summery conditions. 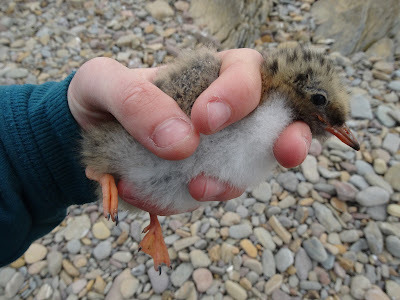 Movement has been slow and attention has been focused mostly on ringing pulli in the colonies. However Crossbills were seen daily until the 5th, peaking with 5 on the 3rd including one trapped, as well as singles on the 2nd and 5th and 2 on the 4th. June's Quail carried on singing on the 2nd, 7th and 8th and a female Red-backed Shrike was new in the Ancum Willows on the 4th-5th. Waders keep moving in the summer, with a Greenshank at East Loch Park on the 4th. Golden Plover numbers peaked at 116 on the 6th and Turnstones peaked 44 on the 5th. 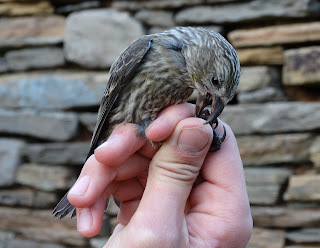 Less seasonal was a Siskin in Holland gardens on the 2nd and 3rd. Perhaps most noteworthy was a Hummingbird Hawkmoth on the 2nd: the first island record since 2011. 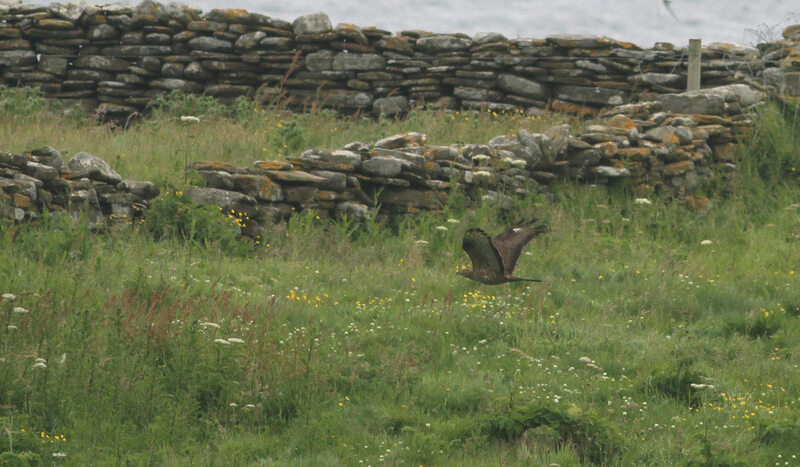 Highlights have included the Black Tern again in colonies near the Lighthouse on 30th June, the singing Quail still on the same date and daily sightings of Crossbills, with 5 on 29th, 7+ on 30th and 2 south on 1st. The unseasonal Whooper Swan remains with us (to 30th at least), while there was also sightings of a Swift and female Blackcap on the 29th, Collared Dove on the 30th and Kestrel and Woodpigeon on the 1st July.